This morning I was frustrated trying to get the new annotations feature in Evernote for Android to work correctly so I went back to using Google Keep to annotate my pictures on my Android phone. As I was annotating a picture I noticed that I could add a voice comment to the same note that my picture was in. To add a voice comment to a picture in Google Keep you simply open the app and tap the camera icon in the "take a note" field. Then after taking your picture (or importing from your camera roll) tap the "+" icon in the lower-left corner to add a note. You can choose to type a note or your can tap the microphone icon to record a note. Then just start speaking. The audio file will automatically be attached to the note containing your image. Sometimes a voice note more accurately conveys what a student wants to remember about than a text note does. 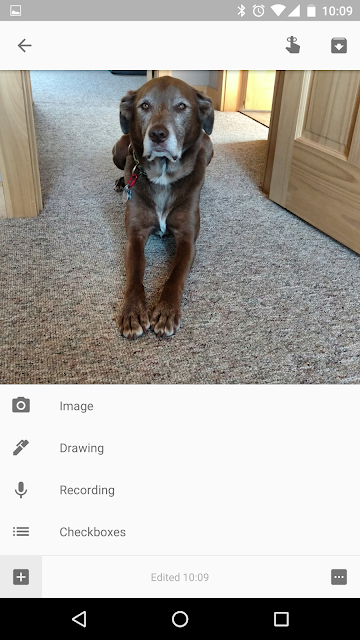 Adding voice notes to pictures in Google Keep could provide students with a relatively easy way to make notes for themselves about a diagram or math problem that you've shared with them.